Antonio de Nebrija University isa private and independent institution in Madrid. The University is recognized by the Spanishgovernment and offers several international programs and courses. It iscomprised of two campuses; in the city is the Campus de la Dehesa de la Villa,and the other is just outside of the Madrid, called Campus de la Berzosa. Mainly the Spanishcourses are taught at the Campus de la Dehesa de la Villa which is about 15 minutesfrom the Madrid’s city center near the university area. It iseasily accessible by public transportation, either bus or metro. The University is named afterAntonio de Nebrija, the first grammarian of the Spanish language and ahumanist. Language is a huge part of the school’s curriculum and thus, theyhave created a special center specifically for the studying of Spanish toforeigners. Since 1985, the Centro deEstudios Hispanicos Antonio de Nebrija, has been focused on training andteaching students and professionals to speak Spanish as well as the Spanishculture. They offer a wide range of programs during the year, except duringAugust, when they are closed. Students attending Antonio deNebrija will also participate in cultural activities and have the option to goon some excursions. International students will co-exist in the Universityamong the Spanish students; the facilities are all of high quality compared tomany public schools throughout Spain. Foreign students will receive a student card uponarrival that will give them access to all these events and services. NOTE: For all courses at the University of Antonio de Nebrija there is an additional inscription fee of 60 euros. The standard Spanish courses areoffered twice per year, once in January and once in September. 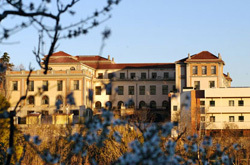 The University of Antoniode Nebrija offers month-long courses during the summer. These lessons, combinedwith complementary cultural activities give the students a chance to practiceand learn Spanish in a multi-faceted way. In each level above beginner thereare two sections to offer a wider range of content. * NOTE: All costs listed are per courses without credits. For information onthe price per course to receive credits please contact us! ***A 60 Euro placement fee is charged for this type of accommodation. ****Upon arrival a deposit is required by the landlord. This will be given back to you when you leave the apartment, but only if it is left in the same condition as it was upon arrival. If you need accommodation in Madrid, please contact us for moreinformation and prices. Don’t forget to let us know the type of accommodationyou are looking for and for how long you wish to rent it.